Real Techniques is a brand that has made its way onto the blog many a time over the last year. Their brushes are such high quality and won't break the bank which is great when most high end brushes start around the 50 dollar mark here. 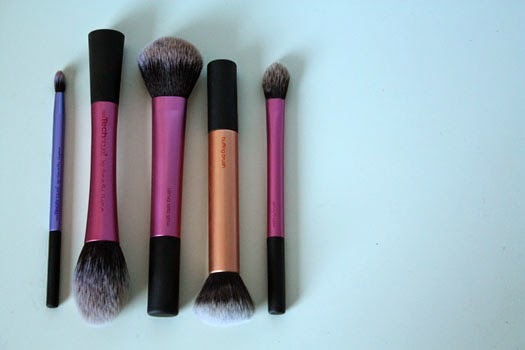 Unlike other brands, a lot of the Real Techniques brushes are multi-use so you can use brushes for different purposes and with a range of products and textures. Today I thought I'd share with you my top five picks from their range. It was hard to narrow it down but these are the best of the best, the holy grails if you will. They're all must-haves in my opinion and here's why..
Multi Task Brush, available in this set-I'm a little bit of a blush noob and the multi task brush just makes life a whole lot easier. It never picks up too much colour, even with the most pigmented of blushers. There's no risk of looking like you've been in the sun just a tad too long. I like to use this with setting powders too as it leaves things looking a lot less cakey. Blush Brush-You can use this for blush obviously but I prefer it with bronzer. The blush brush will stop you from going overboard with bronzing powder as its density means you never pick up too much product. As it is currently Winter here it's being used more for blush. If you can't get your hands on the multi task brush then this is a worthy alternative. Essential Crease Brush, available in this set-Now my #217 from Mac is not going to be shelved anytime soon but this brush is perfect for crease work. Like the setting brush it is also tapered so it gets into the contours of the crease much easier. Again, it blends like a dream. Buffing Brush, available here and also in this set-If you've watched any beauty tutorials over on YouTube in the last couple of years then you are bound to have heard the term "buffing brush" thrown about a fair bit. This is the brush when it comes to applying your base, whether it be foundation or tinted moisturiser. I'm not sure how it does it but your base will look seamless. Blending in product is hassle-free. I only wish this brush was sold separately so I could have a backup. It is certainly a must-have. Setting Brush-This brush is designed for precise powder application but it is amazing with concealer. Its tapered edge makes buffing in concealer so much easier. You won't be left with any telltale concealer lines either. *Have you tried the Real Techniques brushes before? Which are your favourites? I don't have the buffing brush as I didn't get that kit, but the Expert Face Brush is brilliant, and apparently really similar if you're wanting extras. It's my favourite of all the RT brushes! Ooh, how do you find them compared to each other? I've been thinking about getting that particular kit! That's a tough question. Both brushes achieve really similar results but if I had to be picky I'd say the Buffing brush leaves you with an ever so slightly more seamless finish. I also find the Expert face brush is better with lighter bases. It really depends what you're wanting it for. The buffing brush is definitely my favourite, although the multi-task brush is getting some mileage lately for powder. It's easier to use than the big unwieldy RT powder brush! I love the multi-task for powder! It's great when you only want a light layer of finishing powder. Lovely! I recently bought some Real Techniques brushes too and I am really happy wiht my purchase! I also love using the buffing brush to blend my foundation and I use my setting brush to set my concealor with powder as well! I might try your recommendation on how to use the multi task brush! That's good to hear Kitty! The multi-task is so good for blush. I find it never picks up too much colour. I think it can even be used with cream products as well x.